In 2008 the main idea of Agile Tour™ was to communicate massively together, all agile people, in the same period of time to help all cities to promote the ideas around the Agile, a way to manage complex project. Since 2008, this idea continues to create new stories, new cities continue to join us around the world and we want to accompany them to understand and discuss their vision of the Agile wherever there will be projects and people. Massively communicate about Agile: Our primary mission is to conduct a 'Mass Communication' about our development practices throughout the month of October. We want to communicate everywhere there is an audience in order to attract massive attention to our new professional approach. Growing locally: Encourage leadership in all regions of the world in the agile area. Therefore, the mission of AgileTour is to create leaderships and leaders on Agile in all regions of the world in order to do massively a communication between all unified people together on the topic of Agile and impact the profesionnal world. Thus, AgileTour is an action that is intended to make emerge non-profit organizations and enterprise who base their foundation on Agile. AgileTour is just a link between individuals, enterprises and existing official organizations such as AgileAlliance, ScrumAlliance and APLN. At the begining of the story, a group of software professional of Besançon, a little town of France, asked Patrice Petit, their Agile Coach, to help them to stimulate agile practitionners and international speakers to come in their town. Patrice Petit realized that all small towns had the same problem: Unable to bring a person known as a isolated city, Unable to support enterprises and individuals to rapidly transmit this vision without moving far from home. Patrice Petit had the idea to propose a new concept at its personal Agile network. He proposed to do an massive event more important by covering several cities on the same time, in the goal to attract attention in those places and to bring in remote areas of France some prestigious speakers. In 2008, Agile Tour™ grouped seven towns in France and Switzerland to organise their event during october 2008. Patrice Petit was director of eXtreme Programming France, a french non profit organization that promote Agile practices in professional software industry. He generalized the concept, instead of having people come from everywhere in France to an event in paris, speakers come from Paris to local events. He wanted to help people to growth locally. That’s the original concept of AgileTour 2008. Agile Tour™ grouped seven towns in France and Switzerland (Geneva) to organise their event during october 2008. The most noticeable effect is the birth of local group of agilist, local speakers and sometime local company centered on Agile practices. We realized a great dynamic in France that permits to aware company to this practices and methologies. The second impact is to see new companies appear in the countries. In 2009, the concept change to build a network of worldwide local events that could help each-others. AgileTour supported the organisation of 18 events (including three events in non-french speaking places) in 6 countries (Canada, China, France, Luxembourg, Switzerland and USA) during October 2009. The global event was supported by eXtreme Programming France and some local non profit organization. These are small towns that seem to be more interested in this idea. The cities that are far from the concerns of "Bigboss" of Agile. It should be remembered historically that AgileTour was build for these small towns to offer them an important means of expression. Agile Tour™ also revitalizes AgileXXX groups and motivate people to take over in these groups. The ideas submitted in Europe have transformed the business enterprises of the cities and the regions. We were the laughingstock of America during a long time and now the ideas that we realize now, we allow to restore a position of leader in this activity all around the world. In France, we have transcended a big part of companies who have been seduced by the performance approaches. 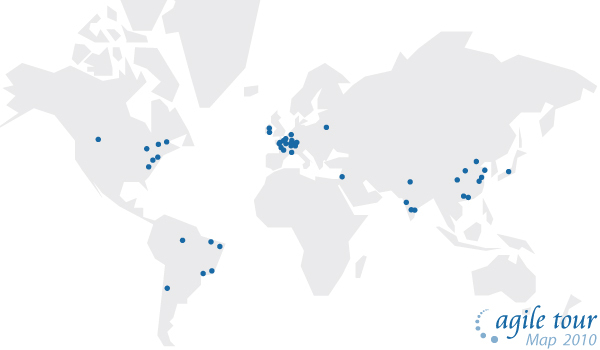 For 2010, AgileTour have supported more than 44 events all around the world. We received 7,500 attendees. The spirit stays the same, help group of people to organize a local event with local, national and international speakers. 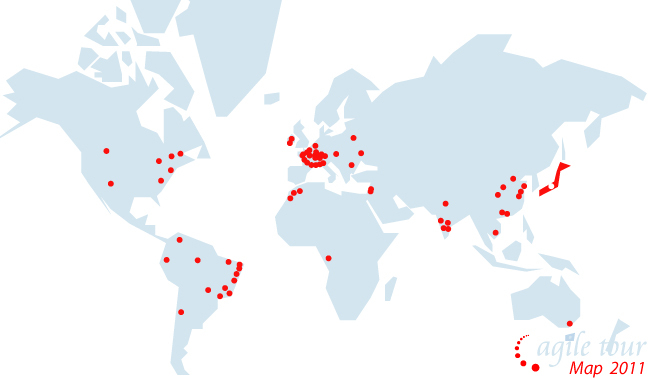 For 2011, AgileTour have supported more than 65 events all around the world. We received 10,000 attendees. The spirit stays the same, help group of people to organize a local event with local, national and international speakers. 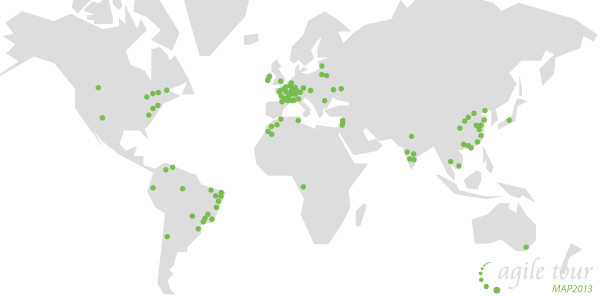 For 2012, AgileTour expect more than 80 events all around the world. We received 14,000 attendees. The spirit stays the same, help group of people to organize a local event with local, national and international speakers. Patrice Petit also created the conference “Chaos and Agile In Action”, a dynamic international research on Agile in the same state of mind. These two projects are undertaken each year in the interest of local individuals and local groups. In 2009, we welcomed more than 2,500 people worldwide. All local organizers are independent and free of all general organization notwithstanding local laws. We work for helping groups to aware in their pratices: practices of event organizers and Agile leader. And finally, we want that the local organization learns and enable others activities on Agile topics, independent from AgileTour or someone else. For that, we are organized in an Choatic mechanism, centered by Internet and locally free of global directive. That's the only way to have an exponential growing and a true leader who emerge from this complex system. The board of Agile Tour™ has the goal to coordinate the events to obtain massive communication event around agile practices. The board organise the call for participation, deploy an Information System (Web-Site, Database) and help organising each event. Each event gain the right to claim to be an Agile Tour™ event, must follow some global rules (introduce Global sponsor at the begining of the event for exemple) but is financially independent. The board propose some rules and templates but each event may change to adapt everything to local condition.There is no management link between the board and the local leader. 7) As a non-profit program, how and what do AT support each city events? The AgileTour board supported by Agile World University provide the global communication, an Information System, a coaching of some local event, the network with other events and the link with the international Agile community to find speakers for example. The particularity of our event is that all organizations are independent of the AgileTour board. They can accept to continue or stop as they want. AgileTour thas not provide financial help usually, but provide organisational help. If the financial situation permit-it It could provide goodies.